To choose a recipe to represent the country's cooking is no easy task, because Dutch cuisine is not... How shall I put it?... exactly wide and varied. But in all parts of the world there have always been a liking for sweet things and is not rare to find a wealth of sweetmeats comparatively higher than savory dishes, even in the Netherlands of austere Calvinist past. By the way, these cookies are among the favorites of Roald Dahl, so he tells in the cookbook that I mentioned in this post. 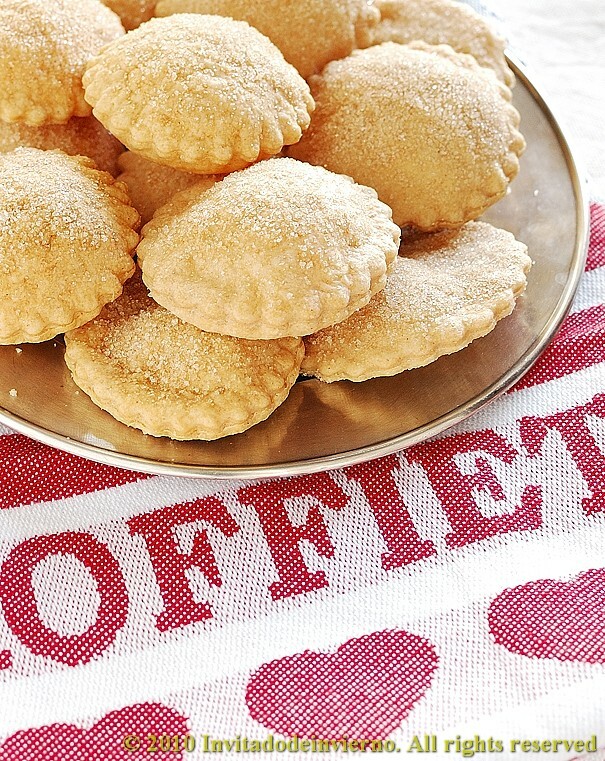 These famous cookies have their origin in the city of Arnhem, a name that we relate to World War II, don't we? Arnhemse Meisje literally means Arnhem girl (check here the pronunciation of Meisje). 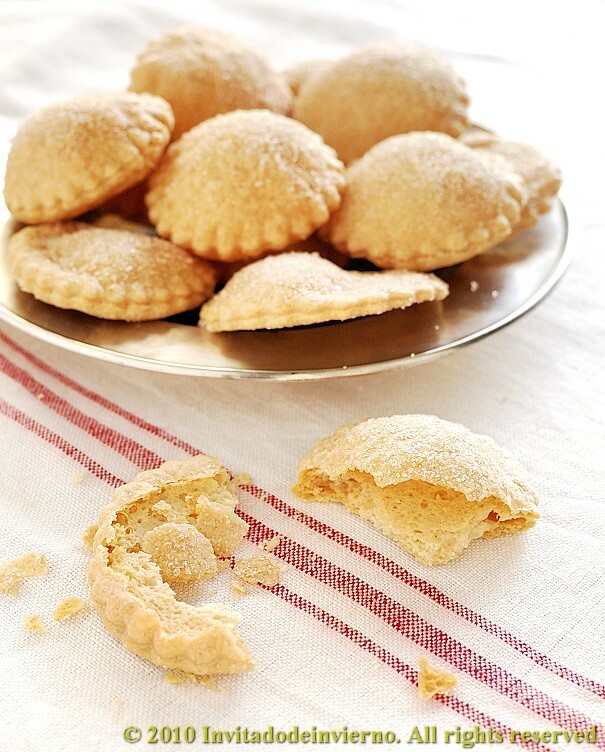 These cookies consist simply of an oval flaky pastry studded with large sugar crystals, baked until they are well toasted and caramelized. They originated in the 19th century in the bakery Zalinge, former establishment of the city of Arnhem, owned by the Hagdorn, which still manufactures them. After a thorough study of the matter (ahem...), to prepare these cookies I've chosen Dahl's recipe, which he claims to have received from the very owner of this bakery. Although in my Dutch cookbook and in many websites the recipe calls for common puff pastry... I also followed the step by step procedure in the web of King Arthur flours, which in spite of not crediting the source, oddly enough follows Mr. Dahl's recipe almost exactly. These cookies are made with baker's yeast. * Sparkling sugar is best for this purpose, so that the cookies really sparkle. I did not have any, so I used regular sugar. Weight the flour, the milk and the yeast and mix on low speed with the lemon juice in a stand mixer. Divide the butter in eight parts and add them one by one on medium-high speed. Wait each time for the dough to absorb the butter, around one minute. You will get a smooth and satiny dough. Put the dough in a bowl covered with plastic and put it into the fridge overnight. The recipe instructs to chill the dough to make it more manageable, given the huge amount of butter it carries, but I believe it is equally desirable to give it time for some fermentation to happen. The next day preheat the oven to 140ºC. 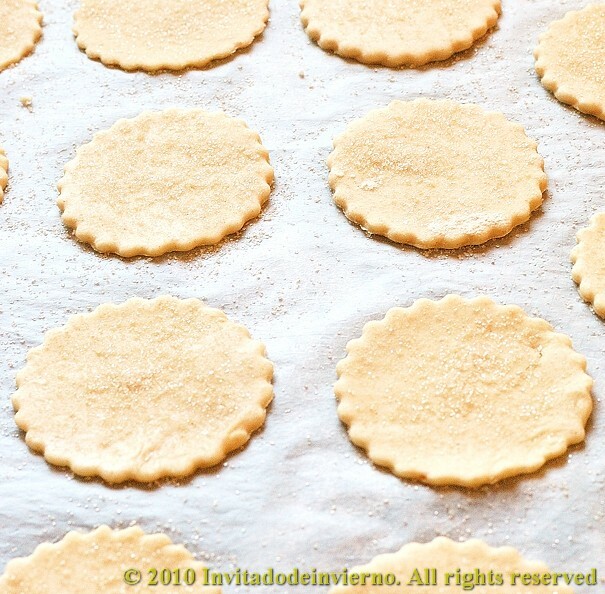 Line a couple of cookie trays with parchment paper and roll the dough on a floured surface. I could not notice any rising in the dough. The actual shape of the cookies is oval, but I have no oval cutter, so I've made them perfectly round. Instead of flouring the countertop surface, you can also just spread the sparkling sugar and roll the dough on it. I think this is a good idea if you're going to cut the cookies into diamonds, for example, and you hardly have trimmings left, but if you are going to use a curved cutter, the dough in the trimmings will take up sugar and I do not like the idea. Flour the surface repeatedly because the dough tends to stick and you have to roll it very fine, something in between 1 and 2 mm. Generously dust the cookies on the trays with sugar, remember the dough itself includes no sugar. Press lightly for the sugar to stick to the cookies. Bake for 45 minutes, until golden. The girls of Arnhem puff up nicely in the oven... Take them to a cooling rack. I found these cookies very "Dutch"... something uncomplicated and that can be delicious with good ingredients. Although as I have not ever tasted the genuine Arnhemse Meisjes, I have no reference. They are very crunchy, with a penetrating aroma of butter... I do not know if they should be more caramelized, but with that oven temperature it is impossible because it does not reach the caramelization of sugar (that's why they have such a bland color). And although it is not faithful to the original recipe, I think a touch of cinnamon would do them good. I'm sending these cookies to Susan's Yeastspotting at Wild Yeast. Those cookies look so good and crunchy! They'd be perfect with a cup of tea! Mmm, que pinta tan buena! El otro dia comentaba con una amiga que nunca hago galletas! Igual me animo a hacer estas! Your posts should appear in the Sunday Magazine of a newspaper! Not only because of what you cook, but I also love how you tell stories...AND the photos!! Qué hacen los del ABC y El Pais, que no te publican??? What a wonderful time you seemed to have had, and these are just delightful. How I would love to enjoy these with a cup of hot tea. wonderful pictures! I loved Holland very much and Vermeer is absolutely fantastic! will take note of the cookies recipe! What a fascinating cookie. I love the way they puff up like that. This would be awesome with a cup of tea on a rainy day. I can just imagine myself gobbling these all up LOL. Nice cookies. When I first looked at the picture I thought they were some kind of stuffed cookie. Nice how they rise up. And I have to see if I can find sparkling sugar, never heard of before, would make them very festive looking. I can almost hear the crunch...sigh, almost. The connect between food and culture always makes everything taste so much better. Love the cookies Miriam ... and love them being all cute and puffy! Funny enough; I have never tasted Arnhemse meisjes before either... I had to laugh about your comment on Dutch cuisine... Not a huge cuisine for sure! lol... I loved your stories of Holland. It's always fun to read about it through the eyes of someone not Dutch! Miriam I wish I could reach into the computer screen and grab a bunch of your cookies. That is so neat the way they puffed up. The town sounds beautiful. Vermeer is also a favorite of mine and the movie was good. Ah so great I see you added your button. Also I would like to tell you that I have an award for you. But I can't remember if you accept them. Either way it's not a problem. Such a nice name for these delicious cookies... Wish I would have a chance to try it or otherwise I think I would need to bake it myself then.. Your cookies look so amazing. I love how its puff up like that. Definitely bookmarking this. Wow these look amazing ~ am bookmarking now! Marta: son muy fáciles y resultonas, yo desde luego las repetiré. MC: the sparkling sugar makes them look marvelous, but I can't find it in Spain either. Simone: yes, I love to do the same concerning Spain! SF: thank you! I don't pass on any awards, nothing personal. Elra: thank you! I love your blog! Lovely looking cookies! Dutch food has influenced our South African recipes quite a lot, so I found this to be a very interesting read.